SO recently during one of my book clubs we got to talking about bug repellant. 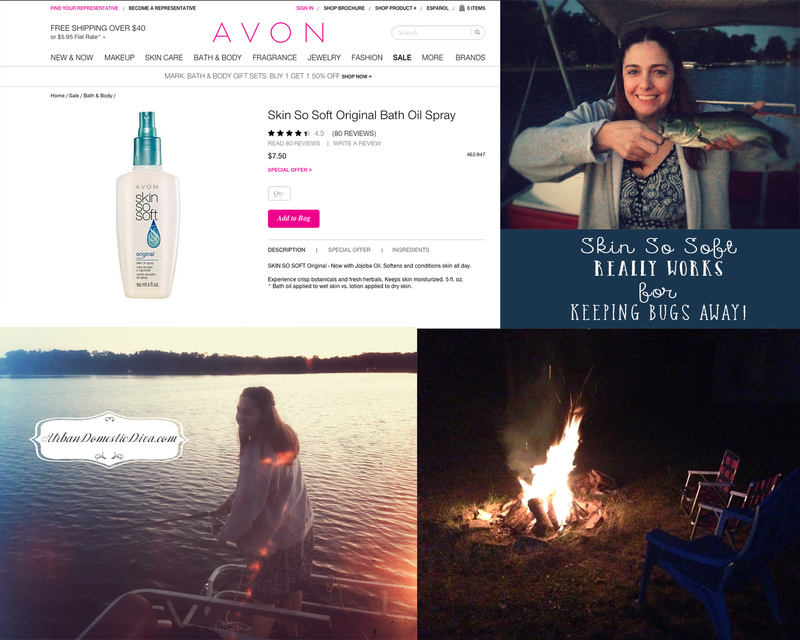 For the life of me, I cannot remember how we got to such an odd subject, but some of the older women in my group swore by AVON Skin So Soft as a bug repellant. They claimed it was even better than Off! or other deet-filled bug repellant, and much safer to use. I had never heard of such a thing-and I am a Girl Scout leader! Evidently this is an old wives tale that has been shared around since the '70s. I was skeptical, but seeing as how we were going to Michigan on vacation and the bugs near the lake at night were intolerable, I thought I should give it a try. We always cut our night excursions short because the bugs were always too obnoxious. So we just go to bed covered in deet. YUCK! I bought a bottle on Amazon because I did not know any AVON reps, but later I discovered you can shop AVON products right through their own website, so it's up to you how you want to get it. The first night we went fishing at sunset. I sprayed myself down. It was a little greasy as it is a light oil. I sprayed my legs, arms, neck and forehead and lightly rubbed it in. Then I fished away. We fished well into 10:00 at night, and I did not get one mosquito bite. NOT ONE. Hubby was getting bit, then he sprayed it on and said he could feel bugs hitting his legs but not landing. I used that spray every night fishing and during campfire nights. I did not get a mosquito bite once. Usually, I am a delicious buffet, but not this time! The one woodland walk I took I forgot to spray myself and I got two bites on my face and two on my arm. So they were around, they just stayed off me when I used Skin So Soft. It works, guys. and there is NO DEET! The only draw back is that your clothes gets a little bit oily. I had a light cotton skirt one night and I noticed when we got back inside, there were some oil stains on the skirt. It washed out easily, so it's not a big deal. Just don't wear anything nice when you are outdoors battling the bugs. I was so pleasantly surprised to find something that works without chemicals, and my skeptical-swarthy-fisherman-husband is amazed it worked at all. True story! I have 15 large mouth bass pictures caught at night to prove it!